With its’ island design presentation and surrounded by lush vegetation, Suizo Loco Lodge is an open invitation to enjoy all that this special area of Costa Rica has to offer. 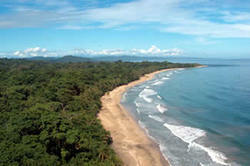 The lodge is only 3 km from downtown Cahuita and just a 10 minute walk from Cahuita’s famous black beach. 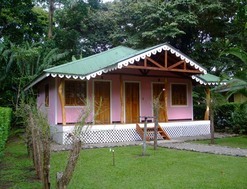 The Caribeean is lush year round making it the ideal location for nature lovers. The area is less wet from February through April, with a short “summer” in June and July, and the wettest months from November through January. 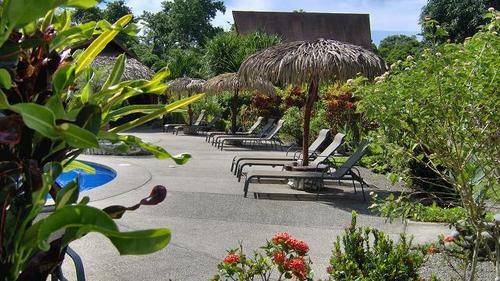 The hotel’s relaxing and charming environment surrounded by native trees and abundant gardens attract and provide a home to a broad variety of wildlife. Birds, squirrels, gekos, armadillos, foxes, iguanas, and aguties are some of the animals that can be seen daily roaming the gardens. The hotel offers three different and comfortable rooms; Standard, Junior suite and Family suite. Each offers; large bathrooms and solar heated water, minibar, security box, ceiling fan, hair dryer, flashlight, candles, and mosquito nets.Please refrain from smoking in your room and please also do not eat there (to avoid insects). Their onsite restaurant “Don Pelón” will pamper you with its’ romantic and private ambiance and their fusion of Tropical and European style cuisine. In the morning,breakfast consists of tropical fruit, homemade jam, cheese, eggs of your choice, fresh juices, european style bread, coffee, all in a friendly and cozy atmosphere. During the day, you are free to enjoy small snacks and light dishes such as homesmoked ham and bacon various salads, pasta, sandwiches or even something sweet to compliment your coffee.